Oh, the summer. Many of us spend all winter either working out or fretting about how to get ready for the warm weather. We want to get fit before it’s time to expose more of our bodies than can be covered up with a winter parka. Hopefully everyone was successful with their cold weather weight loss goals and feels that it’s important to avoid reversing that progress on vacation. Even if you haven’t reached your goals yet, you don’t want to be side tracked by a few days out of town. There’s nothing better than enjoying the time away from home with some relaxation but a vacation can also be a weight-gain trap. 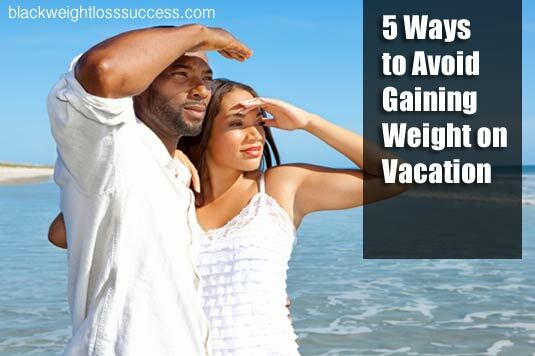 Follow these 5 tips to avoid gaining weight while on your sabbatical. These suggestions will help you preserve all of your progress and hard work. Typically, traveling on a vacation often involves plenty of stops at convenience stores to fuel up and drive-thru fast food, especially when traveling with children. This is something you have to avoid. It’s hard to watch your fellow travelers quench their thirst or have junk food without doing so yourself but joining in could really put a strain on your waistline. Suppose you assume you’re drinking healthy and grab an Arizona Kiwi Strawberry (345 calories) or want to get a little kick with a Rockstar Energy Drink (280 calories) you might as well have a few doughnuts or or 3 ice cream sandwiches for the same amount of empty calories. Then there’s the stresses of traveling that can drive you to have a cocktails, but too many margaritas (full of sugar) and you’ll have to upgrade to a bigger car for the ride home. Vacations are supposed to be fun and allow you to have no cares in the world, which could constitute a lot of eating out at restaurants for almost every meal. It’s hard to underestimate on a vacation just how much of an impact eating all fresh foods for one meal a day can have. Eating a light menu of fresh food like veggies, fruit and fresh fish can give you energy and reduce the risk of feeling bloated or bogged down so you can see more sights and dance the night away. If you’re staying in a hotel or resort for your getaway, try and take advantage of the on site workout room if possible. Even just 20 minutes on the treadmill or exercise bike can keep you on your routine of working out. It can also help to clear your mind for the sometimes stressful family vacations. If workout equipment isn’t supplied get your heart pumping, exercise in another way such as taking a hike, walking around an amusement park, swimming or walking on the beach. A vacation might include a trip to visit your family and keeping up with the tradition of eating at your favorite local restaurant while enjoying 2 to 3 cocktails or super fattening mac and cheese. You should by all means enjoy the time with family and nostalgia but make plans for the 3,000+ extra calories you’re going to have to deal with. Make sure to eat in moderation and schedule light meals the next day to make up for jumping off the wagon. Plan physical activities for your family and friends to burn some calories with you as well. In this online information and GPS age there’s no excuse not to have a good roadmap and blueprint of all the healthy dining establishments in the area you’re about to visit. If you’re a super-organizer you can even map out your meals for each day of your trip at local restaurants or plan to visit a grocery store to have a good mix of home-prepared, healthy dining out, and high-calorie splurges. Online nutrition guides on restaurant websites are your friend. One important thing to remember is that your top priority while on vacation is to enjoy it. This means you should have a few fancy dinners and lounge around when the schedule permits. Eating high calorie foods in moderation and using portion control is key. Looking back on your trip you’ll find the vacation was even more stimulating when you step on the scale back home to a limited catastrophe.